Habitat: Desert, Upland, Riparian. This plant grows on upland slopes and in desert and upland canyons. Description: The flowers are in large, branched clusters at the branch tips. The individual flowers are small and have 5 petals. The flowers are followed by round, 2/3 inch (1.5 cm) wide, one-seeded fruit with a leathery, translucent golden orange skin that darkens as it dries. The berries contain saponins and can rubbed in water to make soap for washing clothes. 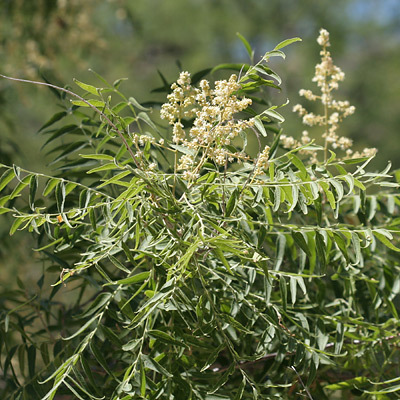 The leaves are green, alternate, and pinnately compound with 7 to 19 sickle-shaped lanceolate leaflets. The bark is rough and gray-brown in color. 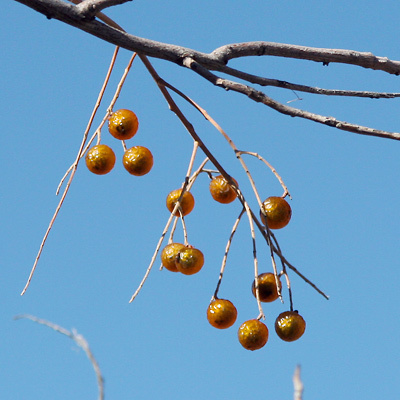 Poisonous – The berries contain toxic saponins.